"Imagine you suddenly found yourself adrift in the ocean with a life preserver but no idea where the shoreline was. As far as the eye can see, there's only the same wide blue vastness. What would you do? Probably tread water, battling waves and struggling against the current. But without a clear direction you'd soon grow discouraged." "That's what life is like when we have no focus. We drift about-going to work, paying our bills, reacting to whatever comes our way, but feeling rudderless. We may even be happy for the most part. But eventually days turn into years and we find ourselves so far off course that we've lost track of the dreams we once had." 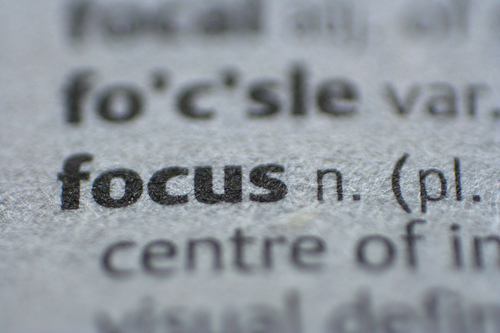 "Having focus provides a reference point, a lighthouse on the horizon to swim toward with enthusiasm and hope. It prevents us from floating, adrift in our own personal sea. to make any lasting change or achieve any meaningful goal, you need to know where you want to go and how you're going to get there." "Without a goal line, the game of football makes no sense, and neither does the game of life."